Notation Capital, founded by former Betaworks folks, is a new pre-seed investment fund launched a couple of months ago. Notation Capital is attempting to institutionalize the round of funding that’s usually done by “Friends and Family”. With just an idea and a co-founder, one could actually raise up to $500K in exchange for 5% to 10% of equity. Really, pre-seed investing isn’t anything new. 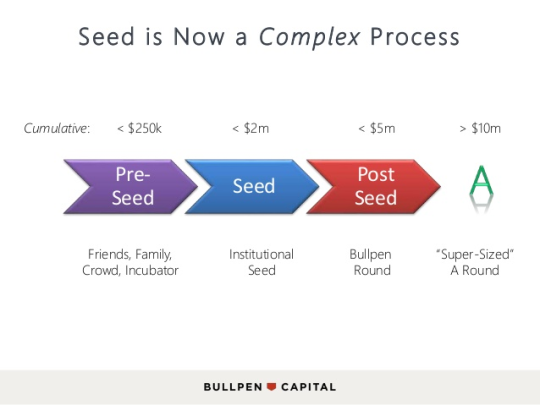 A few years ago, these rounds were simply known as seed or angel rounds, lead by early stage investors like SV Angel, Lerer Ventures, or Thrive Capital. Startup accelerator programs like TechStars and Y Combinator also use a similar model. The thesis here is clear – firms are entering both from below and above the traditional VC-backed period of a startup lifecycle in hopes of capturing more of the returns generated by high growth companies. This is why we continue to see more large and institutionalized seed rounds (by pre-seed capital funds), as well as more large and highly-valued growth rounds (by public and/or PE funds). From a risk/reward perspective, I think funds with “bookend” strategies (either preceding or following the traditional VC funds) likely have lower return thresholds. What would be interesting is to see a partnership between very early and pre-IPO strategies – if one could be used to identify the winners and the other used for putting more capital behind those winners.